Dr. Christopher Blencowe Noble Dunn M.R.C.S.E. Dr Dunn was the village doctor, Medical Officer of Health for the Belper Area, confidant and doctor to Florence Nightingale – a most influential man in the community. He arrived in the village some time before 1851 with his father the Revd Christopher Blencowe Dunn (curate at Crich); mother Eliza; sisters Lavinia and Claressa; brother Robert. Revd Christopher Dunn, curate of Crich. 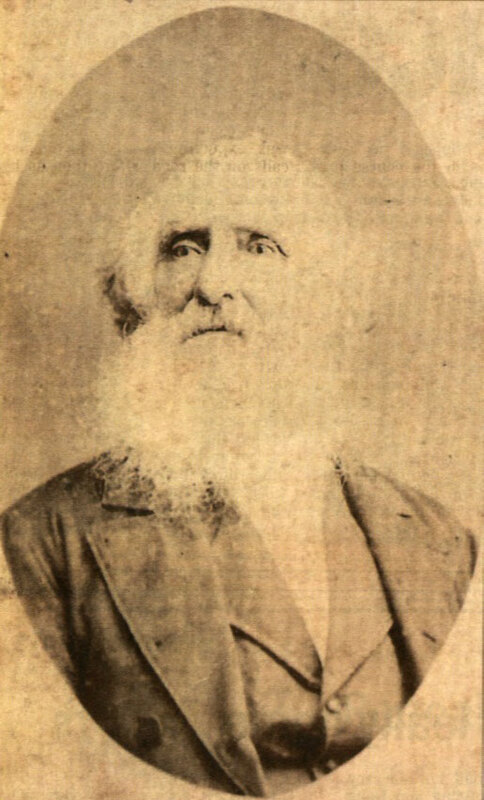 In 1859 Revd Dunn emigrated to New Zealand with his family, except his son Doctor Christopher Dunn, who remained in Crich. Dr Dunn was the highly respected village doctor and medical officer of health for the Belper Union. He was also the doctor for Florence Nightingale and her staff, when she was in residence at Lea. As well as being her doctor he was her friend and confidant. She paid for many local parishioners of Lea, Holloway and Crich to be treated by him. Old Thomas Alison, whom you know has a sort of redness or breaking out al over his head. I trust it is not Gryxipolar (?) Would you kindly see him tomorrow? It is good news indeed that Widow Limb may be able to go to Buxton this year. Could you kindly find directions to some one as to the “small padded board” for the child & charge it to me. I am ashamed to trouble you: but the parents are too stupid: & I have no one here that is clever about these things. Anent (?) Mr Bismarch: Is there a Mrs Johnson? & if so is she at home & would she receive him, his cat? And what is the name of the place? Could you be very kind as to see the child tomorrow, Thursday, look at ‘board’ & child & tell me whether both will ‘do’? Is there much the matter with Hitchcock’s wife? When may we see you here again? Ad. Peach: Could you tell me, besides your opinion of the poor girl, where to get the “powders for the bed sore” which I understand you ordered & also what to do about getting her a water pillow or bed, if you order the use of one? & generally what to do? Hitchcock: Is there anything to be done for him? Is he sinking? The beadstead is out of doors: the bedding in an empty room behind the stanbles. I am always for being on the safe side & should have destroyed them had I known. What would you recommend doing now? Widow Brown was not gone to Cromford this morning. Please give me your opinion (tho’ I know you will laugh) of all the invalids in all the departments of this house. Please send me your Acct. including poor Hitchcock’s: I know that we shall never cease troubling you all the time we are here: so it is no use waiting for the end. I understand that Adelaide Peach the girl with Pericarditis, has bed sores. If this be so you probably know it. Would you wish her to be put on a water bed or water pillow and if so where could either be had? It is said that poor Hitchcock, the man with heart disease, is worse: could you see him to-morrow? and would you kindly tell him to make his mind easy for I wish to undertake all that part of his debt to you which can be rpaid with money? I am told that there is the most abominable drainage smell at ‘Mount Pleasant’ If the “Nuisance-Man” would put that to rights & say the small pox arose there I would gladly be the scape-goat F.N. Would you not have luncheon here? Could you see Mrs Swindell who is still at her own home with your usual kindness. And could you also kindly see Widow Henstock, who is said to have vomited blood a few days ago. Perhaps you would kindly write me word how Mrs Swindell, Widow Henstock & the girl Holmes are? Do you wish your Patient’s hair to be shaved or cut short? Would you say he must not leave off the cotton Jersey next his skin? for if he must not I must get him some more to change? I think the new nurse is a capable woman. Perhaps you would suggest to her what you think best about who is to sit up. I will not disguise form you my opinion that, as long as that figure-head remains no girl can stay with any safety to her health and that the “Doctor’s” opinion very much tallies with your own. For any real good that can be done while that figure-head is there, you & I might have spared our pains & I my anxiety. Poor Emma Collins is so ill again that having no home sh has been sent off to the hospital. I expected it: but not so soon. We have executed what you kindly ordered about Peter Cotterill’s wife, poor thing & are awaiting fresh orders. Have you any orders with regard to Widow Fern & the poor little Duke? I was very sorry not to see you when you so kindly called yesterday with Buxton Admn. I had the mother of your former Patient Elizth. Holmes with me. I conclude that you recommend us to accept “October 31” for Widow Limb’s admission to Buxton Hospital. And I have already sent her up word of it. Possibly however you kindly saw her yourself. I will write to the Secretary unless I hear from you to the contrary accepting & telling him that the 30/- will be sent by the Patient when she goes. Probably the information you kindly gave him will enable him to draw up & send a form of admission. I ascertained from Mrs Holmes what was the difficulty in her daughter’s case. The Secretary having mislaid your Medical Certificate, owing to the time which had elapsed between its date & that of admission they would actually have turned the Patient away, had her mother not taken her to the Medical Officer’s residence & there obtained a fresh examination & a fresh order from him. I conclude that you would have ordered any stimulants from here had you wished it. Widow Fern is very nervous & declares her lungs are fatally affected: I believe that this is not at all your opinion. Have the two poor little “Dukes” hooping cough? I wish she could be cheered up a bit. Old Thomas Alison says “his head is bad” I could not learn whether you had kindly seen him again. I am sorry to say that I have a Patient here for you to come & see. Would you be kind enough to look at the boy Herbert Crooks who brings this? He suffers frequently from sick head aches & as he is growing very fast, I thought a little of your “magic” might do him good. Elizth Holmes has only just begun to take baths at Buxton & wishes for another 3 weeks which with your sanction I will give her. I have failed in my attempt to find a lady at Buxton who would enquire into the Nuring & especially the Night Nursing at the Hospital. I heard that Samuel Hitchcock had not lived out the Old Year. One cannot regret that he has another New Year than ours. I am sure that I owe you many thanks for your kind care of him. I should liked to have known whether he was sensible quite to the last & whether he was ever able to lie up. I was very sorry to hear that poor old Allison was failing. I should be very much obliged to you kindly to do all that can be done for him. He is a very old friend of ours: & it was quite pathetic to see him with his grandchildren. I will tell Mr Yeomans not to spare the money for his diet. Also: I hope that you will be so good as to attend to Widow Limb & send her back to Buxton if you think well. Do you think that she ought to have staid there longer? Elizth Holmes has written to me that she is very grateful for your kind care. Did the Carbonate of Soda treatment answer with the burn of Wheeldon’s child? My maid Fanny is much better for your last prescription thank you. If you would like to send subject required size of window & about the sum to be expended Mrs Shore Smith would gladly go to Messrs Morris & see what could be done both as to beauty & economy. I ought to mention little Lee at St Thomas’ Hospital. we have sent to see him several times & sent him toys, of which however there is no lack. They say he looks 2 years bigger, better, stronger & ?? than when they saw him before he went 3 months ago. He is prefectly happy & contented. The whole ward was dressed up at Christmas: & a musical box, an elephant which would wind up and walk about, a rocking horse which would hold four children & various other wonders bestowed upon the ward, delight the little Patients daily. All have scarlet cloaks. Little Lee is always good & never cries. He is kept lying in his cot. May all New Year’s blessings be showered upon you & yours. Please give my kind regards to Mrs Swan if you see her & ask her to remember her promise to see Mrs Cottrell & let me know how she is. I hope Mrs Swan is well herself. Thank you very much for your letter about the poor lad Edwin Bunting to whom you have been so kind. I hope he will quite recover. I am extremely indebted to you for your kind account of the ‘Patients’ & most thankful that the boy Bunting will recover entirely & that Mrs Bratley is so much better. I hope that you will be able to get Widow Limb into Buxton Hospital again. You have another Patient who is much better & able, I hope, to go out every day and that is my Aunt at Lea Hurst. I have more patients for your kindness. Old Lyddy Prince complains of her head. A poor woman Mrs Broomhead who has an, I fear, incurable goitre, is suffering so much that I thought I would ask you to kindly to try & alleviate the pain. If, after seeing Mr Shore Smith’s ancle (sic) you think he ought not to go to-morrow, would you kindly tell me as well as him? Jane Alison is a second time in a state of religious mania. She is with her sister (Mrs Stone) on Gregory Tunnel. She is very ‘bad’ at times. Will you be so good as to see her? The first thing is: if you could certify that she is in a fit Subject for an Asylum – where she has been once before. Out of respect to her father Thomas Alison, I would gladly pay for her for a few months wherever you thought she had a good chance of cure, whether at Mickleover or elsewhere. Many thanks for calling on poor Mrs Shardlow. She says she is better already: I hope you will kindly see her again. But it is so difficult to know what to do for her. I sent her yesterday a bottle of Port Wine. If you could suggest anything else? One can hardly send her things as one does to old Widow Gregory. Does the Sister eat them? Would you be so very kind as to call upon the sister of Adelaide Peach. Who died last year. I am told she is very ill.
Miss Mochler I am sorry to say is out. She wanted much to see you about some of the Patients. You would not be in this neighbourhood again at 2 to-day to take luncheon with her – or tomorrow, would you? Is old Lyddy Prince recovering at all? His medicine has been finished since Friday. If you are making any calls in this village would you not come come back here & have luncheon at 2 o’clock? Miss Joby is here & Mr Jowelt & see your Patient too? Could you tell me what Adelaide Peach’s sister ought to have? & what Martha Sheldon’s brother (formerly a Patient of yours) ought to have? He is unable to work. How is Mrs Shardlowe? & does she want more wine on ? I have to apologize for not answering our kind note before: I have been so exceedingly overworked. Widow Gregory: I have long urged that she should have her bed down stairs & remain in it & offered to provide a nurse. I have succeeded in providing a Mrs Daybank to remain with her: but I do not even know whether she stays all night: & I am pretty sure that Widow Gregory’s bed is not moved & that they have not sent for the bedstead (from the Co-op Store) which I told them they might order on my Acct. for the nurse.And i have no Miss Mochler to enquire for me for she gone with my Mother. 2. Widow Limb’s daughter with the Quinsy? Is there any different diet you would wish her to have now that it is burst? She has now only Beef Tea twice a day from us. Should you think it possible that Widow Broomhead might undergo an operation in London? If not, how long is she likely to live, & what, poor woman, will be her end? Would you be so good as to come & see Lizzie Brooks? I don’t suppose there is much the matter but she complains of pain in the back & chest & menstruation should have been a day or two ago & was not. You will smile I should not be uneasy about her but that she had an extremely sharp fit of Indigestion in London, owing, I am ashamed to say to over-eating & over drinking & too little work. The Physician who attended her said he had never seen so foul a tongue. And this, the fetid breath & the fetid odour of her bed, makes her a rather anxious inmate for me. Widow Limb’s daughter with the Quinsy says she has caught cold again: I suppose it was only trifling. Your old Patient Mrs Bratby is looking very ill: she & her husband are thinking of going to Ramsgate for 2 to 3 weeks, if you approve & if you recommend warm water baths for her..
Could you kindly see her within the next day or two? And would you, among other things tell me whether she ought to have stimulants? & if so what? Do you sometimes see the boy Bunting who recovered so wonderfully under your care from that accident? Old Lyddy Prince: I saw her last night she expressed the greatest gratitude for your kindness to her. Widow Limb: Would you kindly tell me what your opinion of her is. Since I have began this I have had your kind note: d you think that her state is owing to any want of night nursing at Buxton Hospital, or to neglect there? do you know anything of the nursing at that Hospital? Miss Shardlowe: I have my “Forms of recommendations” for the Derby Infirmary sent me: I only await your orders to fill up one for her. What will happen if she will not submit to an operation to the leg? What will be the operation? What its magnitude? Are there any palliative measures whichit is any use trying? for prevent ease. I think possibly she might be pursuaded to submit to an operation if I knew more. Is there any risk of her losing her leg? but I have a troublesome little inflammation in one eye (& for some weeks the other side of my face has been swollen). I wanted to have some of your excellent advice & to know whether I ought to make the journey the day after tomorrow on account of the eye – You will be amused at my sending to you for this trifle. Could you make it convenient to call to-day? & if so what time? Herbert Crooks is almost laid up with his chilblains. I had meant to have sent my contribution to the Church Choir at Crich, to which Mrs Dunn is so kind. Might I trouble you with this contribution (enclosed)? I hasten to send you a cheque for your qr. Acct. for the people to whom you are so kind & to thank you for your kindness. I venture to ask you to be so good as to give £2 2s (which I have added to the cheque) to Mr Acraman for his school subscription, for which he wrote to me. I must apologize both to you & to him for this unceremonious way of doing it. You ask me about Buxton Hospital Nursing. I have tried various ways to have it cleaned up & cleaned out, chiefly thro’ ladies who I was astonished to find knew of its abomination before – did nothing then & as far as I know have done nothing now. Except that in December I believe the Master & Mistress were dismissed for drinking. The D of Devonshire had much better appear to be acting for himself without mentioning me. But I really pray that the enquiry may be rightly conducted & not made a blunder of. Very many thanks for your kind trouble in the matter of the Buxton Hospital. I am not a “subscriber”. I have positively declined to be so, until the nursing arrangements (which have been unparalleled in England for badness) are put into permanent good order. The way I managed for Mrs Limb and Lizzie Holmes was by paying 10/6 a week for each which became last year 12/ a week and I am not quite sure that it has not been farther raised to 14/ but believe it is 12/. There are the ordinary terms for non-subscribers. I beg to enclose a cheque for £4. 4 which will be 3 weeks each for Eliz Bunting and Mrs Gladwin at 14/ if that is the amount. If not the 6/ each I dare say will be acceptable for the journey. I do not know whether Mr Gladwin is bed-ridden. I conclude that you are satisfied that the nursing for helpless patients is now what it ought to be. Do you not think that if Eliz Bunting has relatives in Buxton, she had better reside with them, and be an out patient? I should be glad to hear what you have kindly done for poor old Mrs Joseph Smith (of Lea) and whether it was a case of Paralysis and difficulty about the urine. My Fanny is much better. She fancies there was much stronger acid in your last medicine. I shall be very glad if you will kindly direct what she is to do in London. She is hoping for the Effervescing steel. I present my Fanny to you – her appetite and strength seem to me very variable. What do you wish her to do next? 2. I am trying hard to get these village people here, whose money all goes in dress and drink, to save. I hope my “converts” may be “enthusiastic”. Last night Mrs Shardlow (the widow; a most industrious woman, whose daughters are making a comfortable weekly income at the mill) promised me that her eldest, Sarah Ellen, should become a member of the Women’s Club, if you will “pass” her. The mother told me that the father, having died of Asthma (? ), she did not think you would admit the daughter into the Club and that “it would hurt her feelings so” if you were “to examine her and not pass her”. This was, I suppose, a mere excuse. But I only congratulated her on her willingness, and said that I would ask you for her. Lizzy and Lyddy (who is almost a dwarf) Shardlow were, at school, little friends of mine. And I would give a great deal if they could be brought up with other notions than dress. Pray help me. 3 Francis, the gardener, is better: he wants more medicine. He will go away on Friday for a week when we are gone. When you said he was “just the man to have epilepsy”, - would you kindly tell me what are the symptoms of a susceptibility to those attacks? 4 About the supposed drain under Vincent Greatorex’s floor: Mr Yeomans tells me that the “drain goes quite the other way” and “never went under the floor” and that Greatorex himself “always said that he got the Typhoid Fever at the mill”. As for the latter assertion, it means nothing: I knew a gentleman who with a cess pool under his drawing room and 3 children dying of Typhoid, declared they got it in the Park! But do you think I ought to try and insist that 2 or 3 paving stones should be taken up to see if there is any foulness under Greatorex’s floor? I am very much obliged to you for your report of our patients. If this fit of rebellion has, as I earnestly trust, passed away, I would not revive the possibility of her doing such a thing. Rose Limb is frightfully spoiled. Tho[ugh] she is put to school at no expense to them, she is allowed to go or not as she pleases. I know you will kindly ask what she is doing. I hope Harriet Limb has entered the Women’s Club and is paying besides a monthly sum into Mr Yeoman’s hands for the P. O. Savings Bank (which I doubt). Yeomans, on condition that her daughter entered the Women’s Club and that her son (who earns 22/ a week) would put money into Mr Yeomans’ hands, which I would double. I have heard since that she did not get the flannel, because it was not to be had at the Co-op Stores. Surely this is very helpless. Could not a neighbour get it for her at Cromford or Matlock? Pardon my troubling you with these details. 3. Hannah Allen. I am very sorry that my old friend the Prophetess is so ill again. She has 2 lbs of meat a week from me; besides milk and cocoatine [coconut butter], some money and other things. And I obtained for her from the Mill a pension of 3/ a week. But if you think other things requisites, please let me know. And please tell me if the damp in the houses is really remedied. I am very glad Ann is so much better, thanks to you. 4 Lizzie Holmes, I suppose, will never be strong again. I am thankful she is better. Her mother is one of the very best women I know of any where. Most glad am I to hear of the improvement in Buxton nursing. Could you tell me who is the present matron? And where from? I trust that the water supply will be obtained. Is the pig extinct near Mrs Limb’s well? Would you kindly remember me to Mrs Swann and tell her I have not succeeded (I hardly expected it) in finding Patty Cottrell a suitable place. I hope she has, for Mr Wildgoose has promised in that prospect not to take her on at the Mill. I am giving you much trouble. I have been so ill and overworked since I returned to London that I must ask you kindly to take this too true apology for my not visiting. I hope Mrs Bratby is better for the removal of abominable cess pit overflow. Is she thinking of Ramsgate? Like a woman, I have two or three PSS: Poor old Widow Gregory: I suppose she is not gone to the Union? Adam Prince: is he keeping sober? Alfred Peach I am afraid to ask after. FN. Mr & Mrs Shore Smith desire me to say: would you kindly come here to luncheon tomorrow (Wednesday) at one to talk over with them the proposed Coffee room at Whatstandwell? Or could you be so good as to come anytime after 11.30, if not to luncheon (tomorrow Wednesday)? We are always glad to hear of the Whatstandwell Coffee room. But if you think the “men do not like our wares” could you suggest anything else, any other foods, drinks or amusements, that they would like better, with which they could be supplied? Are the quarry and labouring me corrupt? – not so much as Londoners – not so much as mill people – are they? Thank you for your kind note about the stone building for the proposed Whatstandwell Coffee Room & for the answers to your Advt. – all of which I have transmitted to Mr Shore Smith. I am glad you saw Mr yeomans. He gladly accepts the office of treasurer to the Whatstandwell Coffee room and proposes that young Mr Sims should be added to the committee. I am very sorry about Adam Prince. I wrote to him on Miss Mochler’s death. He answered & sent some little sum to his mother – at the same time saying o me how much had been spent in drinks!!! I think there may still be hopes of him. Poor Lyddy Prince has been helped this winter – it is a difficulty about this, jnowing that what helps her goes to supply Adam with drinks. She is now on the parish in Holloway – without any one living with her – I am glad she went to you. Do you know of a Mrs Sims of Crich, married daughter of that good woman your old Patient Mrs Limb, who died at Holloway. If she comes your way would you be so very kind as to ask her to write to me about her youngest sister Rose Limb – now married. I am afraid not very well in derby & whose confinement – Mrs Sims has been attending & to tell me how Rose Limb is & give me her married name & address. 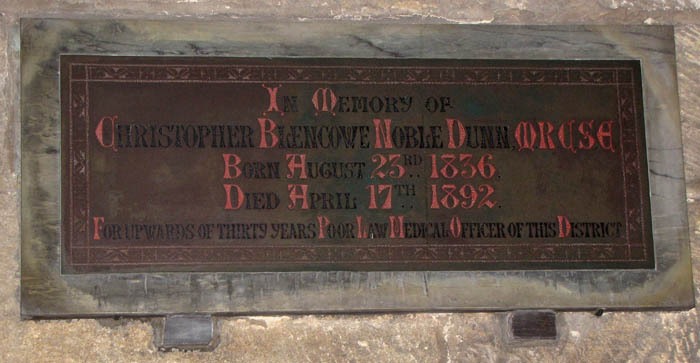 Above the sedilia is a brass encased in marble to the memory of Christopher Blencowe Noble Dunn, M.R.C.S., E., who died in 1892, and was for 30 years medical officer of this district. He was an enthusiastic antiquary, and also wrote several short poems, which, but for an unforeseen accident, would have been published under the title of "In Wood and Meadow."